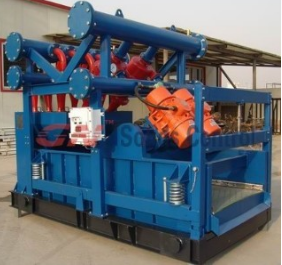 There are a lot of names given to the combination of hydrocyclone and shale shaker. In NOV, it is called mud conditioner; while Derrick, flow line cleaner; Mi swaco, mud cleaner; in China, GN Solids Control, also named it mud cleaner. There are six mud conditioner types: King Cobra Mud Conditioner; Cobra Mud Conditioner; LCM-3D Mud Conditioner; Mini Cobra 2-Panel Mud Conditioner; Mini Cobra 3-Panel Mud Conditioner; King Cobra Venom Mud Conditioner. The differences is the shale shaker, and the number of cones. There are 5 models in GN Solids Control: GNZJ83-3 GNPJ70-3 GNZJ63-3 GNZJ83-2 GNTJ60, two kinds of shaker GNZS Linear Motion Shale Shaker, GNPS Balanced elliptical shale shaker are available. The National Oilwell Varco? Brandt? King Cobra Mud Conditioner utilizes a combination of hydrocyclones and a King Cobra shale shaker to separate solids from liquid. The combination of hydrocyclone cones utilized is dependent upon the specific application of duty. Cone combinations typically consist of a desander cones (10-inch or 12-inch) and desilter cones (4-inch) which are properly sized to handle over 125% of the flow rate. GNPJ&GNZJ mud cleaner is a normal model of our company,we can design customized cost-effective mud Cleaner for customers special needs.Our mud cleaner can meet almost all needs for oil & gas well drilling fluids treatment system and HDD Mud Recycling System. These cones are mounted above the screen deck of the shale shaker. The drilling fluid (mud) is fed first through the hydrocyclones, where the discharge cascades down over the shale shaker screens. This helps to reduce the amount of mud attached to the discharged cuttings. To further increase separation efficiency, and optional VFD G-Force Controller is available for the King Cobra shaker, which allows the operator to tune the G-forces exerted on the shaker bed to one of three settings: 6.1 (NORM), 6.7 (HIGH), and 7.3 (MAX). GN mud cleaner is very popular all over the world, and especially suit for the Chinese ZJ series drilling rig equipments, or alike rigs. Customized design are also available.